The New York Aquarium, located on the boardwalk at Coney Island, is the oldest continuously operating aquarium in the United States. The aquarium was located at Battery Park when it originally opened in 1896. It moved to its present location at Coney Island in 1957. Aquarium admission is by pay-what-you-wish donation on fall/winter/spring Fridays from 3:00–3:30 p.m. (the aquarium closes at 4:30) and on summer Fridays from 4:00–5:00 p.m (the aquarium closes at 6:00). Every day military discount: Active duty and reserve members of the U.S. Military qualify for free general admission, plus 50% admission for up to three family members. The Military discount is available at the admission booth. Valid ID is required. Details. Regular admission price is $11.25 when purchased online. Boardwalk View. Use arrows and compass to scroll. 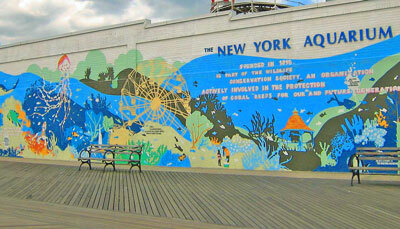 The New York Aquarium is located on the boardwalk at Coney Island Beach, near the intersection of Surf Avenue & 8th Street. The address is 602 Surf Avenue, Brooklyn. The aquarium is open 365 days a year, but operates under reduced hours during the winter months. September – May Aquarium hours are 10:00 a.m.–3:30 p.m. Park closes at 4:30 p.m.
June – August aquarium hours are from 10:00 a.m. – 5:00 p.m. Park closes at 6:00 p.m. The exact dates of the change in operating hours varies from year to year. Visit the aquarium website to confirm hours of operation before you visit.